Cook pasta according to package directions. Drain and return to pot and set aside. 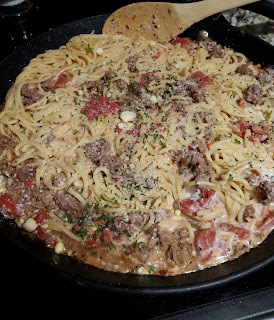 In skillet over medium heat, add ground beef, breaking meat up as it cooks. Add onions, salt, pepper, and crushed red pepper, cook until no longer pink. Add minced garlic, italian seasoning and diced tomatoes, stirring. Stir in sour cream and pasta. Sprinkle with parmesan cheese and chopped parsley.